Coming off the Thanksgiving weekend, it feels like a new time of year. Happy holiday time! The winter holidays can be full of joyful, cherished experiences and good cheer, and for lots of us this time can also be stressful due to overscheduling, or sad for a variety of reasons. Even before I was part of creating My Amazing Day, I had experienced that gratitude was a gift in both those kinds of states. In fact, those experiences were a big part of why I was so excited when Elizabeth and Lori asked if I would work with them on the project that became My Amazing Day. If you are having a joyful holiday time, a wish I have for you is to remember about expressing gratitude. That could be expressing it to others or expressing it to yourself, by speaking, writing. or creating art. I have found those expressions help me connect more deeply to sweet times. And if you are having a hard time this year or have some difficult moments, I also have a wish for you to remember about expressing gratitude. For me, when I am feeling blue, identifying what I’m grateful for is the way I can cheer myself with the most ease. Often in those times, I find gratitude for the simplest things to be the most heartening—the feel of soft cotton, being able to see a color I love, appreciation for a painting or song. 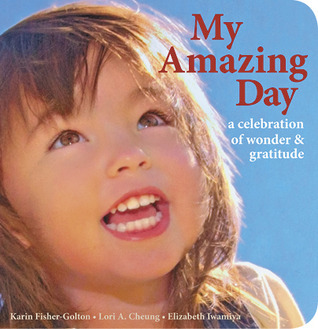 If you have young children in your life, showing them your expressions of gratitude can help them connect this time to delights beyond the material parts, which can be so dazzling. To spread some thoughts of wonder and gratitude in the winter holiday season, I’m giving away two copies of My Amazing Day at Goodreads. I invite you to enter and spread the word, if you’re on Goodreads. Giveaway ends December 04, 2017. And if you’re looking for copies of My Amazing Day for gifts, ways to find the book are listed here. Wishing you a holiday season full of wonder and gratitude! This entry was posted in My Amazing Day News on November 27, 2017 by Karin Fisher-Golton.